Gord Kemp started his electrical business in 1994 with two employees and a half-ton truck. Now 25 years later, the company has grown to close to 150 employees, has changed names to KE Electrical and Kemp has two partners who joined him in 2011. The owners attribute the success of the company to their dedicated employees and pride themselves on having that ‘family’ company feel. Kemp along with partners Peter Richard, currently of Aylmer, PQ, and Abe Wall of Lanark, made a corporate donation of $10,000 to the Almonte General Hospital Fairview Manor Foundation on behalf of the company and their employees. The funds are in support of the Hospital’s drive to purchase new diagnostic imaging equipment and bring a CT scan to the Hospital as well. Each of the partners had their own reason for supporting the campaign. For Wall, it made sense because Almonte has been his family’s Hospital for many years. His two children were born there and everyone has had to use the Emergency Department at one time or another. Although Richard doesn’t live in the area, he’s had trips to the Emergency several times over the years, due to the hospital’s proximity to their office. Kemp has long considered the Almonte hospital, their hospital but having had several grandchildren born there, the attachment has certainly become stronger for him over the years. 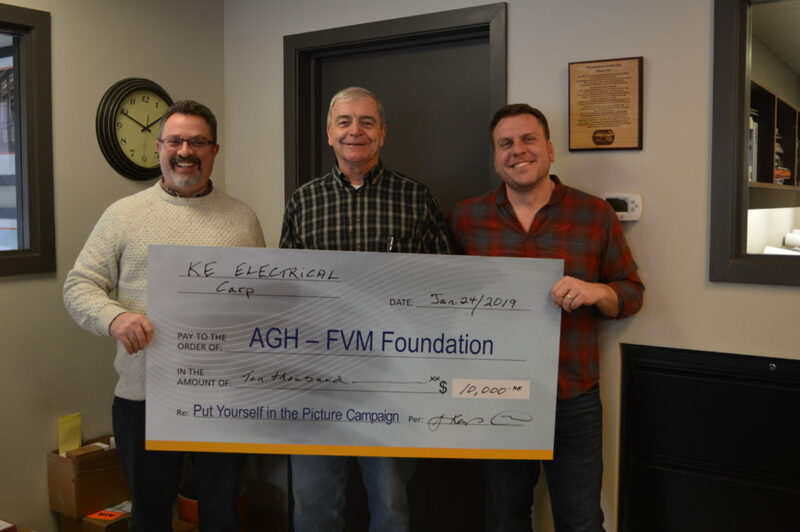 KE Electrical is active with other charities as well supporting causes associated with mental health, child poverty, homelessness, and local food banks to name a few. All three businessmen agree that it feels good to be able to give a little back in support of local health care close to home. KE Electrical is also connected through their CFO, Jesse Lowe (who grew up in Clayton), who sits on the Foundation’s board. The company is very supportive and understanding of his commitments toward the Foundation and the campaign. To join KE Electric and ‘put yourself or your business in the picture’ call the Foundation at: 613-256-2500, ext. 2297.